Here’s to another week, and another roundup of Facebook news that might have slipped through the cracks. Facebook has been getting quite the attention in the past few weeks, much thanks to its Facebook Home rollout. We’ve corralled the recent news you may have missed by need to know. Facebook has its developer’s interests in mind, which a recent acquisition proves. The social network will acquire Parse, a toolkit for developers that provides the backend resources to build cross platform mobile apps. Cutting through the developer-speak, all you need to know is that Parse provides the infrastructure so devs can concentrate on the front-end – making the app look and feel pretty. It means there it will be easier for more people of varying skill levels to make more, better looking, better functioning apps. Developers are important, if not critical to Facebook’s continued success, and the social network knows this. By acquiring Parse, Facebook has unprecedented access to a community of developers who are building mobile apps, meaning that Facebook can nudge these developers to adopt Facebook’s Open Graph and Connect integrations. This means more third-party content bubbling up to your News Feed, for better or worse. This might be the first time that Facebook has admitted that over-sharing isn’t such a good thing after all. 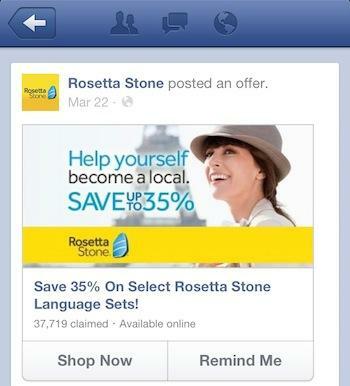 TechCrunch reports that Facebook isn’t forcing its users to automatically share Offers once an offer has been claimed. Users can purchase these offers privately with little fuss or worry that your friends might see it. In the wake of TechCrunch spotting this minor update, the report also notes Inside Facebook having spotted silent upgrades of Offers earlier this month. Offers has been updated with larger photos, a remind me button that sends you an email at a later date, and a “Shop Now” button that sends them to the retailer’s website. If there’s any company plagued by phishing scams, it’s Facebook. Malicious social engineers and hackers are trying to outwit Facebook users into giving up their user names, passwords, and other critical personal details. One that Hoax-Slayer.com has uncovered is an email notifying its users that their accounts are in danger of being blocked due to questions about its authenticity. And users are told that they need to take action within 24 hours to avoid being blocked. Of course Facebook has no part in this, except being the victim. So if you ever receive an email asking you to click on a link due to questions about the authenticity of your Facebook account, just close it and delete it (or ignore it). To entertain your curiosity, what happens when you click on the link is that you’ll be taken to a suspicious looking website (warning bells should be going off at this point) that will ask you to reconfirm the account by typing in the email address and password. Then once this part is over with, you’ll be asked to submit other personal details including your date of birth, and even your credit card number under the false pretenses of protecting your payment information. Richard Williams, the guy responsible for the Apple Maps hiccup, and Loren Brichter, a former software designer of Twitter’s iPhone app, have been picked up by Facebook reports Bloomberg. Apple was given flack for its shortcomings with Apple’s attempt to replace Google Maps late last year. Williams took the fall and was consequently axed by Apple. What Facebook wants with Williams is anyone’s guess, but Bloomberg’s sources say that he’s joining Facebook as a manager of the company mobile software efforts. Considering his history with Apple and the fact that Facebook has been scooping up ex-Apple employees, we’d have to say that he’ll be doing something related to Facebook Home. 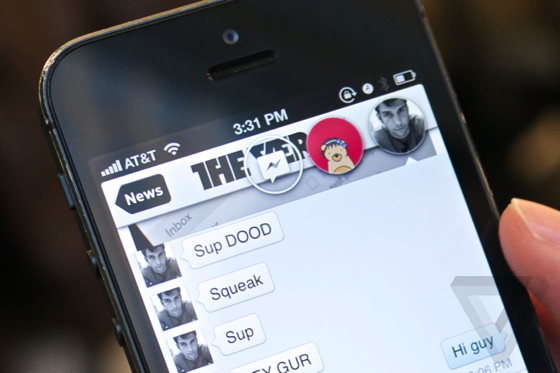 Facebook Home and Chat Heads rolled out to Android devices, but iPhone owners were left in the dark. While it’s impossible to deploy Facebook Home on iOS without Apple’s go ahead, which reports say that is something that Facebook is working on along with a Windows Phone version, the social network has settled for the next best thing on iOS for now. 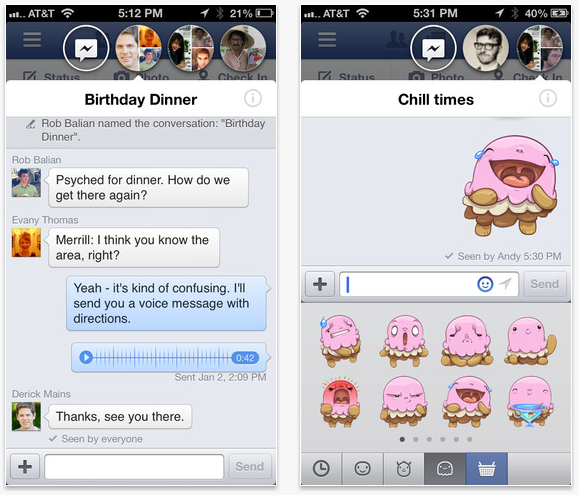 Facebook’s updated iOS app now has enabled an in-app Chat Heads feature as of last week. Chat Heads on iOS isn’t superimposed on your iPhone, but it does pop up every time you receive a Facebook Message on Facebook’s main app. You can even drag the Chat Heads to any location within the app. Along with the iOS update, Facebook also rolled out stickers – a feature we’ve seen in many other major messaging apps on the market. In case you haven’t used LINE, WeChat, or other messaging apps before, stickers are giant emoticons that express a wide range of emotions that you can add to your messages with a quick tap. We saw Path release stickers as well this year, evidence that points at the fact that stickers are a core feature among successful mobile messaging apps. The Facebook stickers are free for now, but considering the revenue that others, like LINE, generate from stickers. We’d expect to see paid stickers rolling out soon enough. The Verge tried out the hack and said that despite the occasional lag or freezing of Chat Heads, it mimics the Android version minus the ability to pull SMS messages. The jailbroken app will be available in the Cydia app store and on Github likely within the week once he figures out a workaround for the freezing. Not quite celebrity news, and not quite tech-relevant, but we couldn’t help ourselves. Controversial Napster founder and Mark Zuckerberg “mentor” is getting hitched. And if you’re familiar with Parker’s extravagance, well you’re not going to be surprised about what he has planned to tie the knot with fiancée Alexandra Lenas. Reports say that Parker is planning a $10 million wedding “fit for a Hobbit.” Costumes for attendees, props – including prop ruins, bridges, ponds, and other glitz and glamour Lord of the Rings style will set the theme of the wedding, which is apparently costing a cool $8.6 million. Should you friend you boss? The consensus says no. A survey conducted by SodaHead and YouTell found that 81 percent of 722 participants weren’t comfortable with the idea of being Facebook friends with their boss. We’ve already established that some HR professionals will check your social media accounts (to a varying degree), while other employers have gone as far as requesting the passwords to these accounts. You’re risking the chance that your employer might find something about your lifestyle that could draw scrutiny to your professionalism, or even lead to the possibility of being fired. Then again even if you’re not friends with your boss but friends with a coworker who is, there’s a good chance that what you share (if your coworker friend is tagged in it) will surface on your boss’ News Feed. At the end of the day, we always recommend Facebook users not to publish anything they’re second guessing in the first place since there’s always a chance they’ll regret their decision down the road.